The Out of The Darkness Walk raised over $6000 for suicide education and prevention efforts. Photo by Margaret Gautrau, Photo editor. 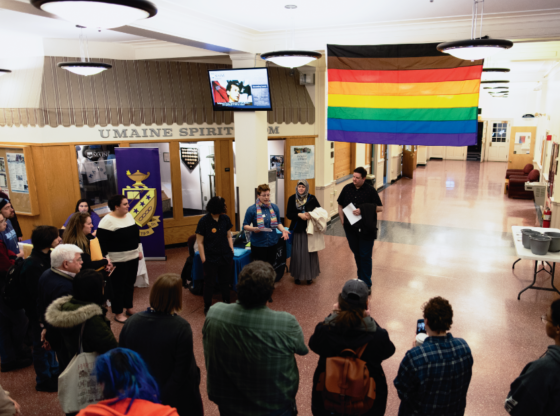 On Sunday, April 29, the University of Maine hosted its first Out of the Darkness campus walk. Students and members of the community came together at the Mall on campus to raise funds and awareness for suicide prevention and research. 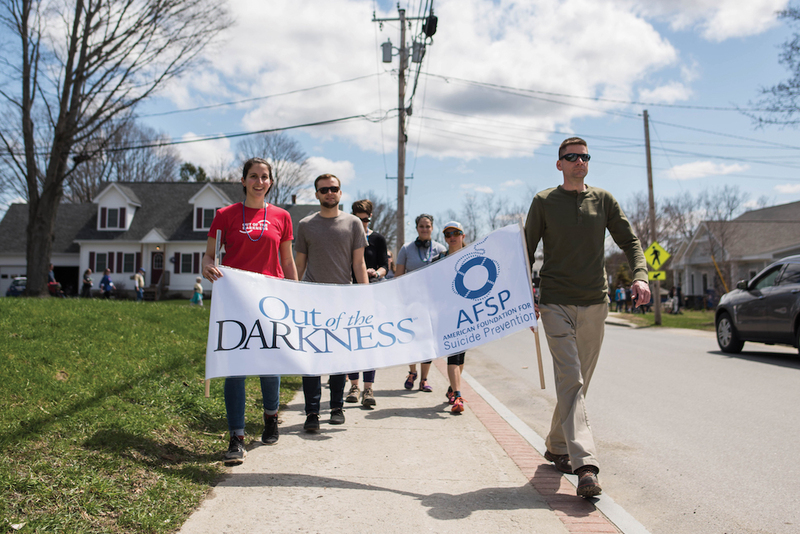 The Out of the Darkness Walk is a nationwide event created by the American Foundation of Suicide Prevention (AFSP) to raise money and awareness about suicide. The UMaine chapter organized the event with the Counseling Center. They surpassed their goal of raising $3,000 and ended up with over $6,000 in donations. Andrea Pereira, a graduate assistant at the Counseling Center, who chaired the walk, hopes the event raises awareness of how prevalent suicide is, and gives strength to those afflicted. “My hope is that all those present at this event will see the attendance and feel comforted by how many people care about this cause,” she wrote. 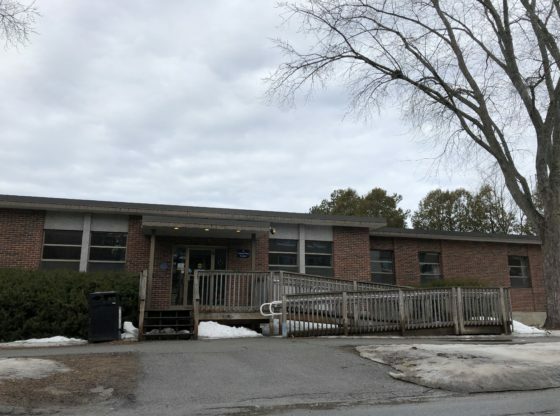 The idea of the Out of the Darkness Walk was first introduced to UMaine through a community event held on campus about 10 years ago, according to Douglas Johnson, who works at the Counseling Center on campus. The first three walks were funded through a grant the Counseling Center received. 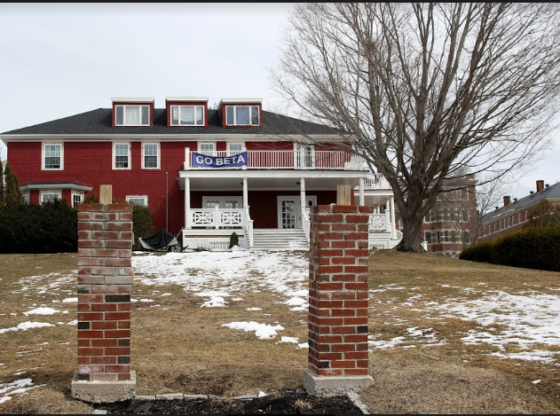 The last time that UMaine held the community event, they raised over $30,000 and had over 850 attendees. Wanda Cunningham works at the Counseling Center and attended the walk. She remembers helping organize the community walks for the first few years they were on the UMaine campus. Cunningham lost her husband to suicide in 2003. She remembers how meeting with people who had been through the same thing helped her cope with her loss, and now she attends events like this to show support for others. Cunningham understands many college students are affected by suicide, so she thinks the campus is a good place to host a walk. “I like the fact that they had it on campus,” she said. The Counseling Center was represented at the walk by counselors Jessica Browne and Amy Moran. An information table featuring the available resources on and off campus was set up by Browne and Moran during the registration period prior to the walk. When asked about the importance of this event to the university, Moran expressed that she thought it was “hugely important [because] suicide is something that affects everybody and it is a significant issue in the college student population.” Suicide is the second leading cause of death among 15 to 29-year-olds, according to the World Health Organization. One of the key points that the Out of the Darkness Walk and the Counseling Center aim to make is that you are not alone. The Counseling Center provides students with free individual and group counseling to anyone interested. Their Office of Outreach Education and Prevention can be found in the Mind Spa in the Memorial Union. 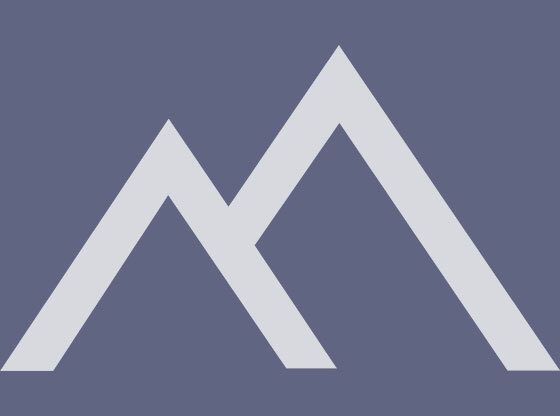 “[The Mind Spa] is a space open to everyone whether you are seeking counseling or not,” Moran explained. In the space, one can attend informational sessions or workshops and participate in some of their many therapeutic activities, among other things. Leah Braley is a student at UMaine who attended the event. She participates in many public service projects through her sorority, Gamma Sigma Sigma. She likes that it was a somber event and enjoyed walking in support for suicide prevention. “Suicide is something that’s affected my family personally,” she said. The event opened with guest speakers at the commencement ceremony. Then the attendees walked through campus. The event ended by the steam plant on the Stillwater River. Attendees took turns throwing white flowers in the river in remembrance of lost loved ones. There were volunteers from the Counseling Center, the UMaine AFSP chapter, various athletic departments and many individuals. Campus Activities & Student Engagement also sponsored and volunteered for the event. Donations are being accepted until June 30. If you or someone you know is in crisis the National Suicide Prevention Lifeline can be reached at 1-800-273-TALK.